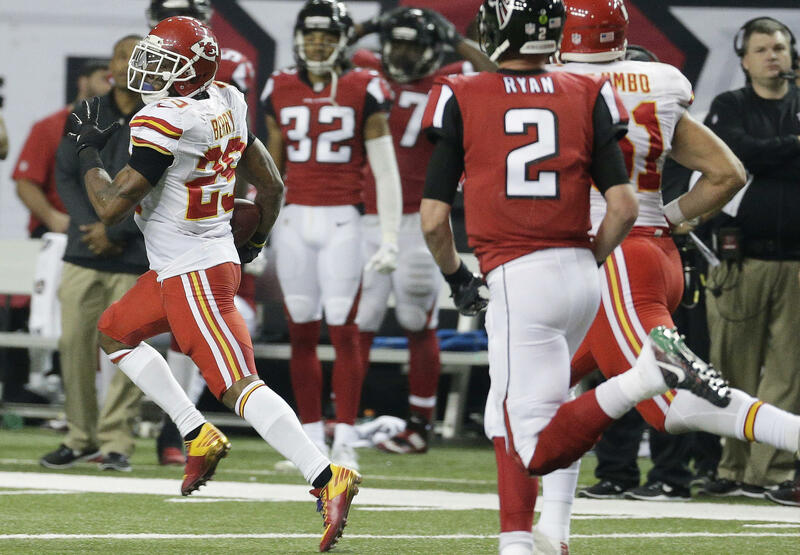 ATLANTA -- Eric Berry returned an interception for a touchdown, and then brought back another pick for a 2-point conversion that gave the Kansas City Chiefs an improbable 29-28 victory over the Atlanta Falcons on Sunday. The Falcons (7-5), rallying from a 27-16 deficit, went ahead 28-27 on Matt Ryan’s 5-yard touchdown pass to Aldrick Robinson with 4:32 remaining. Those weren’t the only big plays for the Chiefs. GLENDALE, Ariz. -- Carson Palmer threw for 300 yards and three touchdowns and David Johnson scored twice. The loss by the Redskins (6-5-1) clinched a playoff spot for the 11-1 Dallas Cowboys. Palmer’s 25-yard touchdown pass to Johnson with 11:09 to play put Arizona ahead 24-20, the fourth lead change of the second half. After a Washington field goal, Palmer’s 42-yard pass to J.J. Nelson with 1:56 padded gave the Cardinals (5-6-1) a 31-23 lead. Washington drove to the Arizona 28-yard line before Patrick Peterson’s interception of Kirk Cousins’ pass with 41 seconds left sealed the victory. Johnson, who also scored on a 1-yard run, became the second player in NFL history to top 100 yards from scrimmage in the first 12 games of a season. Edgerrin James was the other. OAKLAND, Calif. -- Derek Carr threw for 260 yards and two touchdowns to rally the Raiders to their biggest comeback in 16 years. After falling behind 24-9 following touchdowns on the first two drives of the second half for Buffalo (6-6), the Raiders (10-2) took the game over with 29 straight points. They won their sixth straight to remain one game ahead of Kansas City in the tough AFC West. Oakland scored touchdowns on three straight drives, including scoring strikes from Carr to Michael Crabtree and Amari Cooper for his sixth fourth-quarter comeback of the season. This was the biggest comeback for the Raiders since overcoming a 21-point deficit to Indianapolis to win 38-31 on Sept. 10, 2000. The defense also tightened by forcing three straight three-and-outs and then getting a turnover when Khalil Mack deflected Tyrod Taylor’s pass that Nate Allen intercepted . PITTSBURGH -- Ben Roethlisberger passed for 289 yards and two touchdowns, Le’Veon Bell rolled up 182 yards of total offense, and Pittsburgh’s resurgent defense harassed Eli Manning into a flurry of mistakes. Antonio Brown edged good buddy Odell Beckham Jr. in their personal showdown, catching six passes for 54 yards and an acrobatic scoring grab at the back of the end zone. Tight end Ladarius Green added six receptions for 110 yards, both career highs, and a touchdown as the Steelers (7-5) won their third straight to keep pace with Baltimore atop the AFC North. Manning completed just 24 of 39 passes for 195 yards with two touchdowns and two picks in the red zone for the Giants (8-4), whose six-game run ended with a thud. Beckham was largely a non-factor despite a game-high 10 receptions for 100 yards. SAN DIEGO -- Jameis Winston threw a go-ahead, 12-yard touchdown pass to Cameron Brate midway through the fourth quarter and Keith Tandy intercepted Philip Rivers in the end zone with 2:56 left to give the Buccaneers their fourth straight victory. Rivers had the Chargers on the move in the final minutes before Tandy got in front of a pass to Dontrelle Inman and picked it off. Tandy’s momentum carried him into the end zone, giving the Bucs the ball on their 20. They ran out the clock. The Bucs (7-5) pulled into a tie with Atlanta atop the NFC South. Rivers threw two second-half interceptions, including Lavonte David’s pick-6. The Chargers (5-7) were trying to get back to .500 for the first time since Week 2. GREEN BAY, Wis. -- Aaron Rodgers threw for 209 yards and two touchdowns, and the Packers pulled away with two fourth-quarter touchdowns. The Packers (6-6) weathered snowy conditions at Lambeau Field, making just enough plays on the cold turf. Brock Osweiler connected with DeAndre Hopkins for a 44-yard touchdown pass with 1:51 left to get within eight for Houston. Nick Novak missed the extra point, with footing slippery at Lambeau. The Texans (6-6) had one last shot after the Packers failed to run out the clock. But Osweiler’s last-ditch pass-and-lateral play from Houston’s 12 with 4 seconds left failed, handing Houston its third straight loss and dropping it into a tie with Tennessee atop the AFC South. Nelson finished with eight catches for 118 yards and a touchdown for Green Bay. NEW ORLEANS -- Matthew Stafford passed for 341 yards and two touchdowns. Golden Tate exploited a coverage breakdown on third-and-long for a 66-yard touchdown early in the fourth quarter when Detroit (8-4) was clinging to a six-point lead. The Lions, who’ve won seven of eight, dominated statistically, but four opportunities inside the New Orleans 20 ended with Matt Prater field goals, allowing the Saints (5-7) to stay close until the fourth quarter. The Lions also became the first team in 60 Saints home games to stop Drew Brees from completing a touchdown pass, although tight end Coby Fleener had a pass bounce off his hands at the goal line. BALTIMORE -- Joe Flacco threw for 381 yards and four touchdowns, and the Ravens overwhelmed the Dolphins in the first half to end Miami’s six-game winning streak. Baltimore (7-5) led 24-0 at halftime behind Flacco and a dominant performance from the league’s second-ranked defense. Flacco went 27 for 34 for 258 yards and three scores over the first 30 minutes, and the Ravens yielded only 115 yards and intercepted a Ryan Tannehill pass. That was enough to provide the Ravens with their fourth win in five games. Miami also is 7-5. Flacco finished with a franchise-record 36 completions in 47 attempts, by far his most impressive outing in an uneven season. He entered with 11 TD passes and 10 interceptions. FOXBOROUGH, Mass. -- Tom Brady became the NFL’s career leader in victories by a quarterback, earning his 201st by throwing for 269 yards and a touchdown. Brady, who was 33 of 46, had tied Peyton Manning last week in a win over the New York Jets. His lone touchdown came on a 14-yard pass to Chris Hogan in the first quarter. LeGarrette Blount scored the game’s first touchdown , rumbling for a 43-yard, ankle-breaking score in the first quarter while spinning around safety Maurice Alexander in the process. He finished with 88 yards on 18 carries. The Patriots (10-2) have won seven of their last eight. On the same day that Los Angeles coach Jeff Fisher and general manager Les Snead were given contract extensions, the recently relocated Rams (4-8) proved they still have a long way to go after losing for the seventh time in eight outings. JACKSONVILLE, Fla. -- Bradley Roby returned an interception 51 yards for a touchdown, helping the Broncos gain ground in the AFC playoff picture. Roby picked off Blake Bortles’ wobbler across the middle in the third quarter and went untouched the other way. Star linebacker Von Miller hit Bortles as he released the ball. It was the 11th pick-6 of Bortles’ three-year career and his third in the last four games. Houston and Detroit also returned interceptions for touchdowns in games the Jaguars lost by less than seven points. The latest one resulted in a seventh consecutive loss for Jacksonville (2-10) and secured another miserable milestone for the small-market franchise. The Jaguars became the fifth team in NFL history to post double-digit losses in six consecutive seasons, joining Tampa Bay (1983-94), Detroit (2001-06), Oakland (2003-09) and Cleveland (2008-13). Jacksonville had a chance to tie in the final minutes, but Bortles fumbled trying to make a play in the pocket. The Broncos (8-4) rebounded from an overtime loss against Kansas City, and with Miami’s loss at Baltimore, moved into position to get one of the conference’s wild-card spots. CINCINNATI -- Andy Dalton threw a pair of touchdown passes and Cincinnati finally got its depleted offense moving without receiver A.J. Green. The Bengals (4-7-1) got their first win since Oct. 23, beating a team that’s in a swoon of its own. The Eagles (5-7) opened the season with three straight wins, but have dropped seven of nine. Dalton had completions of 50, 44, 29, 23 and 21 yards. The Bengals scored on each of their first six possessions for a 29-0 lead, reinventing themselves with Green and running back Giovani Bernard sidelined by injuries. The previous time they scored on their first six possessions was 2009 against the Bears. The only bad moment: Mike Nugent missed another PAT kick wide to the right, his fourth miss in a span of five tries. Nugent made field goals from 32, 33, 26 and 38 yards, the last one deflecting off the left upright. CHICAGO -- Jordan Howard ran for 117 yards and a career-high three touchdowns and the Bears handed San Francisco its 11th straight loss. The Bears (3-9) finished with a season high in points and picked up a rare win in a matchup between two of the NFL’s worst teams. Matt Barkley, making his second start with Jay Cutler sidelined by a season-ending shoulder injury, went nearly the entire first half without a completion. But he led a touchdown drive near the end of the second quarter and finished 11 of 18 for 192 yards.